Home » Relationships » HAIR ON MY BF'S BALLS ARE GREEN & BROWN; YET HE WANTS "HEAD"
It smells of stale urine and sheet sef. He has 2 main boxers. Batman boxers and Manchester united boxers. He won't wash them. Joro so I burned them and bought him new ones. 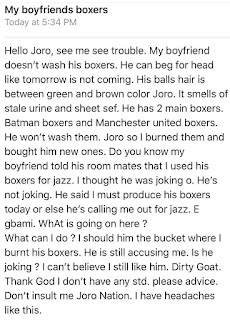 Do you know my boyfriend told his room mates that I used his boxers for jazz. I thought he was joking o. He's not joking. 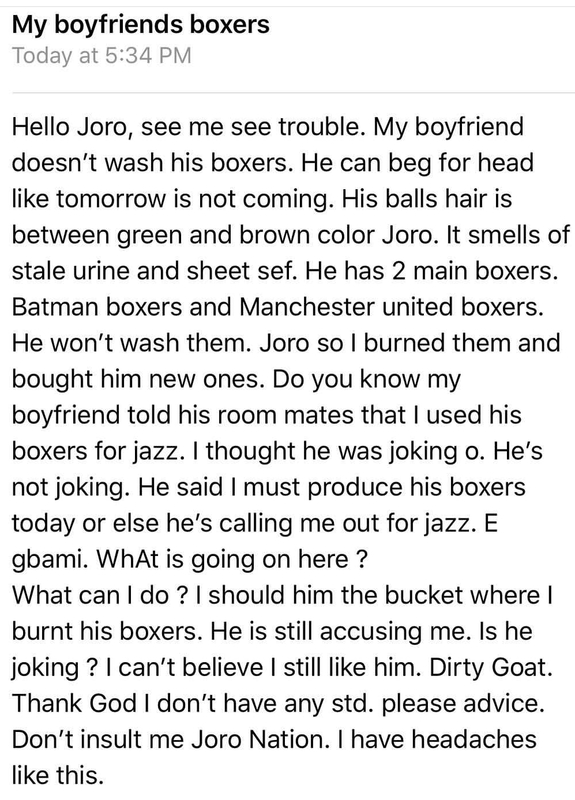 He said I must produce his boxers today or else he's calling me out for jazz. E gbami. WhAt is going on here ? What can I do ? I should him the bucket where I burnt his boxers. He is still accusing me. Is he joking ? I can't believe I still like him. Dirty Goat. Thank God I don't have any std. please advice. Don't insult me Joro Nation. I have headaches like this.